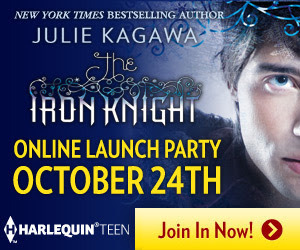 Julie Kagawa's Iron Knight releases tomorrow, and we're celebrating with a Twitter party that will take you right up to the official moment! Join Harlequin Teen, Julie, and a panel of Iron Fey-crazed bloggers tonight from 10p.m.-12a.m. EST to celebrate along with us. There will be Team Ash/Team Puck/Team Grim questions, awesome giveaways, behind the scenes exclusives, and a super-special announcement from Julie. Victoria Schwab (The Near Witch), Saundra Mitchell (The Vespertine), Beth Revis (Across the Universe), and Christine Johnson (Claire De Lune) will all make special guest appearances throughout the night. Ash's never before seen letter to Meghan will also be revealed. Learn more about the Iron Fey series at http://www.ironfey.com/. Hope to see you at the party tonight!